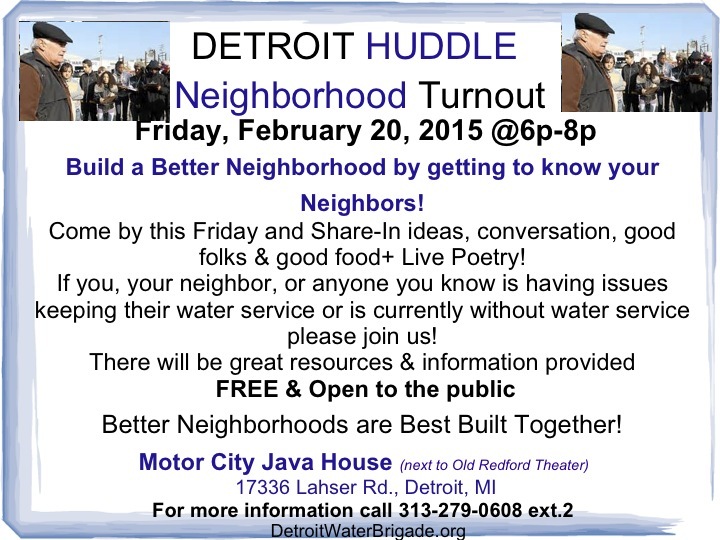 DETROIT, MI — The Detroit Water Brigade is hosting a series of Community Town Hall Events to educate, illustrate and motivate residents about the importance of water. The event is from 6:00pm to 8:00pm. Dinner will be served along with live poetry and spoken word presentations to keep residents entertained in a positive experience. Detroit Water Brigade Trained Advocates will also help residents with consultancy on their water bills and provide other helpful resources at this event. The focus for the Community Huddle is to bring neighbors together in a forum, expressing what they want their community to look like. Residents will interact with each other through a variety of icebreaker exercises and will discuss important issues such as water, foreclosures and come up with ideas and solutions for how to preserve our public water commons. Demeeko Williams says this event will give residents the chance to make their voices heard and to get together with other likeminded individuals that will connect and network with each other to start the beginning of neighborhood involvement. For More information contact the Detroit Water Brigade: Demeeko Williams, 313 279-0608 Ext 1, or AtPeace Makita, 313 279-0608 Ext 2.